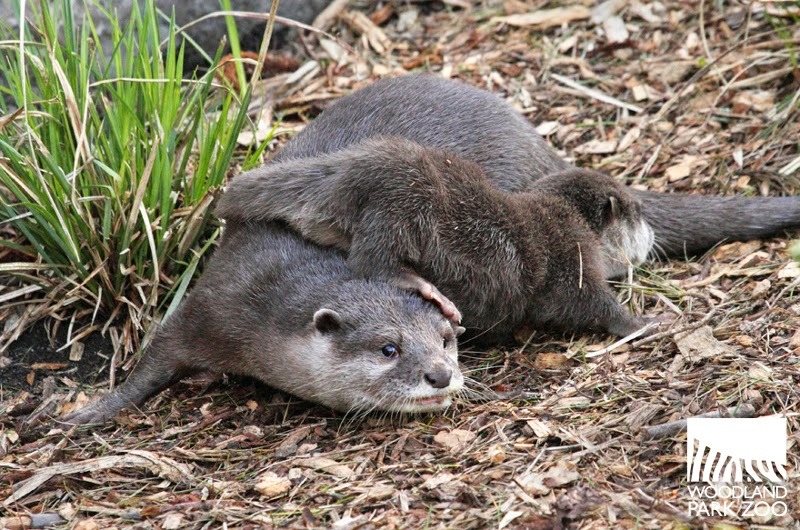 Guntur, the infamously over-protective otter dad, has finally let the newest pups take their first steps outside! The four pups—three girls and one boy born in January—have only had a few tiny adventures outdoors so far. Though they step out for only a few minutes at a time, the good news is that dad seems to be getting more comfortable each time. It helps a lot that the pups’ have a dedicated family that also includes mom and four older brothers to show them the way. …and sometimes that means letting the pups figure out their own way. The pups aren’t yet the most coordinated little movers, but they’re quite capable of planting themselves into prime snacking position, which we learned when keepers gave them some grubs outdoors. Video: Otter pups venture outdoors. Keep in mind if you’re planning a visit that the otters’ time outside is still quite irregular. Though we provide outdoor access, it’s ultimately their choice whether to go out and how long to spend out there. We ask for your patience for a few more weeks as the family gets settled!